What is it about bowling that seems to include a strong feeling that you are connected to the ball? You know it has left your hands because you feel the release of that extra weight from one side of your body. You see that very same ball shrinking in apparent size as it quickly moves away from you. But you still feel connected. Even with this great distance between you, as it is finally about to strike the pins you lean sharply to the left. A motion that on some level you believe will give the ball one final adjustment. Move it one more centimeter towards victory. At least that’s how I roll. Great, now I regret playing video games instead of developing telekinetic powers. I do the same thing in bowling. Finally, I have decided that the best method is to close my eyes, spin, and throw the ball randomly – I’ve gotten an almost perfect game out of this, don’t laugh! But usually, I lean to the left and gesture with my hands, too. 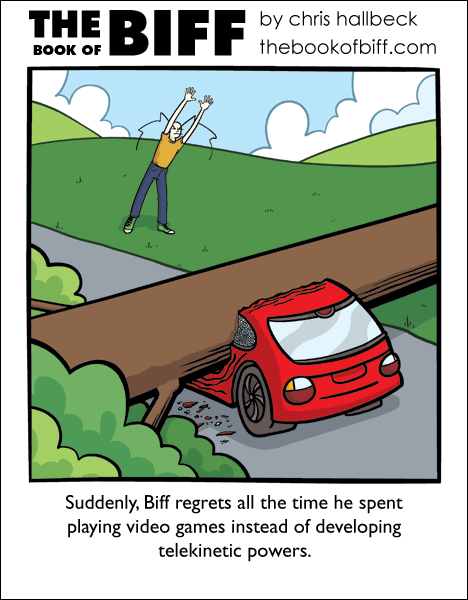 Even if Biff can lift the tree, how would he fix his car? Meh. Telekinetic powers are overrated. Trust me. Telekinesis? Pfft. Give me PYROKINESIS!!!!!!!!! Who needs telekinetic powers when you can have a crane delivered with a cell phone call? @Doctor Why- Couldn’t you just have it fly to you? I dunno – Biff seems to have swatted that car rather effectively. Either he’s got the powers and doesn’t know it, or the trees are very suggestable. ARTCMAYWCTANROAYCUFOA* is where its at! I mean, then you could get Telekinesis, Pyrokinesis, and every other ability you want with (*almost*) no hassle. @MikuJess – But it’s right there next to the red one! Huh. Maybe there’s something wrong with me! Except for the follow through, I typically just stand and watch the ball, to see whether I need to adjust my stance or something for the next throw. No attempts at telekinesis. I will admit to stomping the floor if I’ve missed in the same place for the third time in a row — but that’s just bad temper; I don’t really think I can make the ball go right if I stomp the floor. As for on-line … I have caught myself leaning or trying to look around virtual trees or buildings, especially when I’m trying to keep my character from getting killed in a dangerous area. I can’t help it. Your little rant thingy under the comic reminds me of the Flintstones. If you pay attention you’ll notice that Fred controls the bowling ball with his toes.